I have a new, self made computer, with an AMD Athlon x2 240 2.8 ghz processor, and a gigabyte motherboard. Everything worked fine until a few days ago. I was watching some super-HD video on youtube, when my internal speaker started beeping in a semi-continuous manner. The beeping ceased as i closed the video, and CPU became less stressed. Same thing happened again, while playing some computer game. I used everest to get to the root of this. It gave me three distinct temperatures - CPU Temp, CPU #1 Temp, and CPU #2 temp. While the individual temperatures of the cores are normal, the first temperature listed is abnormally high - 90 - 100. 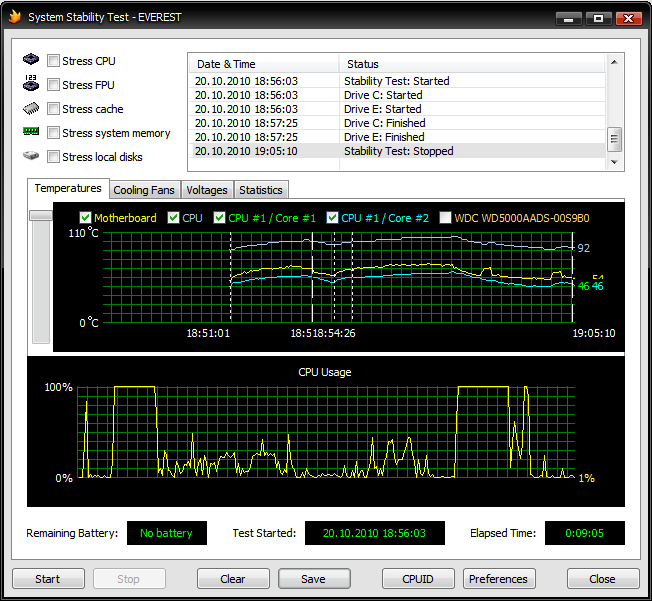 I also stressed my CPU, and the beeping sound returned, most notably when stressing the cache. Does anyone of your know what this means? If you get repetitive beeps, your CPU is overheated. If you get alternating high/low beeps, your CPU could be seated wrong or is defective. Try installing more fans or other means of cooling the system. You could use water pumps for PC's, Heat pipes which are just pipes filled with fluids, or peltier cooler which gets colder when voltage is applied in addition to fans to help keep it cooler. If you go to an mmc and add in the event viewer, it may give you a better indication on what is going on. Add the snap in event viewer, and look under system and applications for errors that may be related to your CPU. The beep is not repetitive. It is continuous. I do not understand how the individual cores stay at normal temps, while the CPU as a whole is 40*C hotter. Another weird issue is that if i intentionally stress the CPU's cache (not the CPU itself) the beeping starts before the CPU has even a chance to start heating, while stressing the CPU itself takes a tag longer. I can't find the beep codes for the AMD, but I believe it may be the video card isn't seated properly or your memory is going bad, or the power supply could not be giving enough watts to support everything. The most likly culprit would be the powersupply since it works fine until you tax your CPU. What's the wattage on your powersupply? I have yet to use one of them, so you'll have to walk through it and try to figure out how to use them. sound like your ram is broken....replace it or try another ram.. This thread is 5 months old! more RAM or better graphics card?